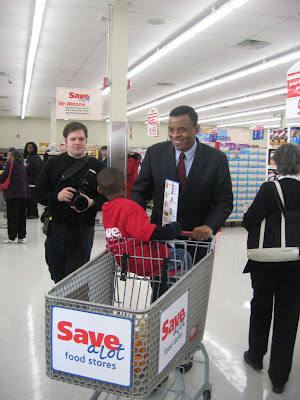 I headed out to Charlotte, NC to the grand opening of the new Save-A-Lot grocery store at 3033 Freedom Drive. I was invited out as a North Carolina food blogger and was excited, since I don't think I've ever been to a ribbon cutting for a grocery store before. Probably not. I think I would remember that. The day started off stressy, because I borrowed my son's TomTom, and he had the sound shut off. There is nothing much more useless than a GPS that does not talk to you. I stopped three times to try to fix that including getting help, but all the kids were in school, and none of us older folks could get that figured out. Since I allowed an hour and a half for an hour trip, I made it about 5 minutes before the grand opening. WHEW! I hate cutting things close like that. Next time, maybe I'll camp out or buy my own TomTom and hide it from the boys, so they do not mess with the settings. In any case, I made it to the Save-A-Lot - which is always a good thing when folks are looking for you. 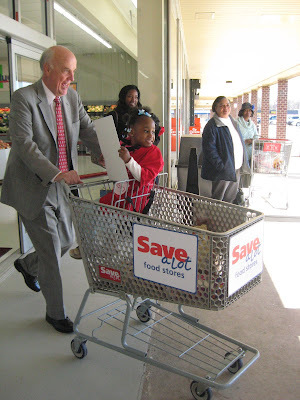 The North Carolina Secretary of Commerce, J. Keith Crisco, was one of the special guests at the Save-A-Lot opening. I snagged him for a photo, since I'd promised some of my grill buddies that I would come back with, at least, one photo to post at Grillers Index. Mr. Crisco is probably wondering who the heck grabbed him for a picture (-: But, he was a great sport. And, now he knows the Barbecue Master was at Save-A-Lot. During the ceremony, Mr. Crisco noted that it was good to have stores offering low prices including healthy foods like fresh produce. Some of the budget grocery stores are slack on produce and meats, but Save-A-Lot has a nice selection. It's fresh too. I just ate a yellow delicous apple from the store. Another thing noted by Mr. Crisco is that the new store in Charlotte means 25 more jobs in the area. Since there are six new Save-A-Lot stores in the Carolinas, that means several new openings which is a good thing with a 11% unemployment rate in NC currently. Another VIP at the opening was the mayor of Charlotte, Michael Foxx. I'd not had a chance to meet him before, and he was very personable. Mayor Foxx recalled that when he was a kid, his family would have to drive a good ways to a grocery store. The prices in his neighborhood were too high, or the quality was lacking. He was glad to see Save-A-Lot come to the Freedom Drive area of Charlotte, and he proclaimed today as Save-A-Lot Food Day in Charlotte. I was expecting a traditional ribbon cutting where someone simply cuts a ribbon and declares the store "open." Save-A-Lot made it more fun than that. They had the VIPs roll some really cute little kids around in baskets on a scavenger hunt around the store. To start off the grocery hunt, they lined up the carts and pushed through an opening day banner. Then, it was all over the store to find the food items on the list. I had to laugh when one little girl told Mr. Crisco that she really thought they needed two loaves of the wheat bread. She is going to grow up to be a savvy shopper I'm sure. And, Mr. Crisco grabbed her a second loaf. 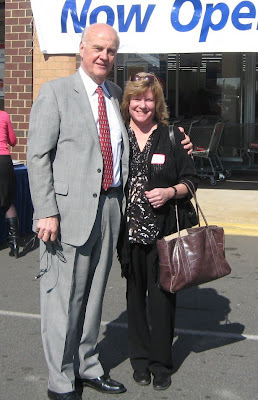 The grand opening of Save-A-Lot was fun. Everyone had a super time - especially the kids. 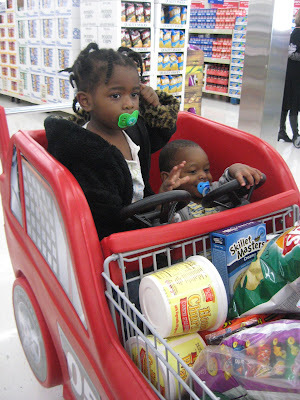 There were large carts perfect for shopping with little ones and with plenty of space to make a big grocery run. 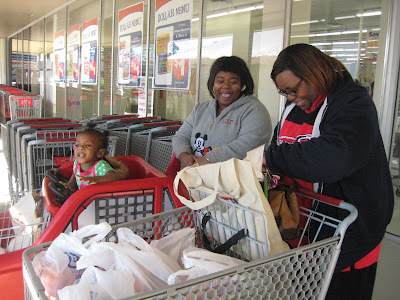 The grown ups got earth frinedly Save-A-Lot shopping bags with food samples like cereal, brownie mix, and fresh produce. 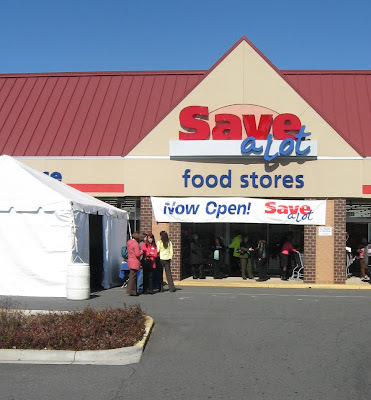 If you missed the grand opening, you can still check out Save-A-Lot in the Carolinas and get $5 off $20. Also, sign up for the Save-A-Lot club online. They have recipes and also print off coupons to take to the store. The coupon is good through 4-10-2010. Check out Save-A-Lot early to get extra savings on top of the already super low prices.